Dr. Alberts is one of Apicha Community Health Center's newest providers. She received her medical degree from Thomas Jefferson University, where she was a Dr. Levitt Summer Research scholar. 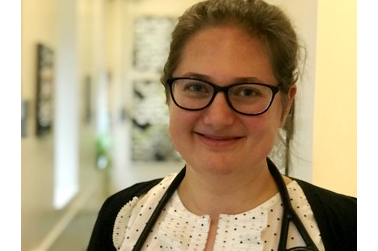 Her interest in preventative medicine and building longitudinal relationships with her patients inspired her to pursue a career in Family Medicine. She is a member of the American Academy of Family Physicians and the New York State Academy of Family Physicians. Dr. Alberts feels strongly about delivering quality care to underserved and marginalized populations and is thrilled to join the Apicha CHC family. 1. When did you first get into medicine? About seven and a half years ago. I had been working in marketing and economics for a little while, and I just didn’t really find that was my passion. So I was very inspired by my husband and family who loved what they were doing. I started thinking about what I would love to do, and medicine seemed like a really good fit. 2. What do you like most about working at Apicha CHC? The patients. I don’t think I came here with a preconceived notion of what it would be like at all. I’ve worked with a lot of older and very sick patients in the past, which makes you feel helpful. But here the patients seem to be pretty young and healthy for the most part. I like meeting them. It’s another part of medicine that I’m getting to know. 3. What’s your favorite thing about being a provider? I really feel like I’m helping people and it’s very intellectually stimulating. Just caring for other people I feel is really important. It’s a good cause, so it feels like a good fit. I do a lot of traveling when I can. I love Europe, and San Francisco. If I had a different life that’s where I would be. I do a ton of cooking, and I’m also a new mom.